Navajo Pearls... 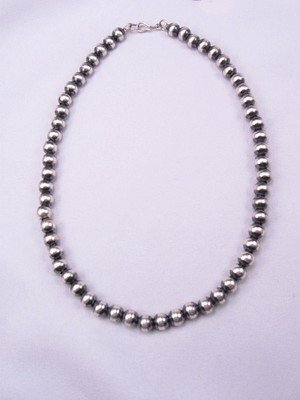 Native American Sterling Silver 8mm bead necklace. 18 length. Antique brushed satin finish, hand finished by Navajo silversmith, Marilyn Platero . Item#3131-18. Length: 18. 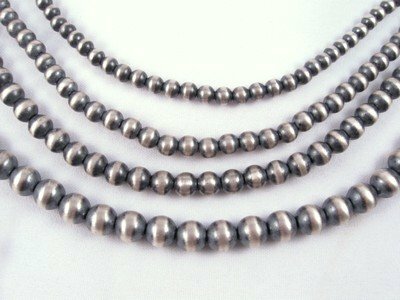 Size beads: 8mm. Weight: 30 grams. Brand new in perfect condition. Gift box included with your purchase. Created by Navajo, Marilyn Platero. 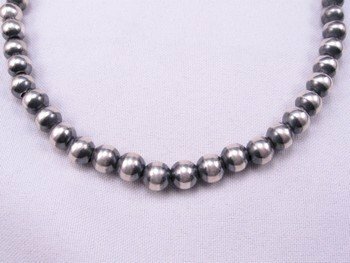 We have many Navajo Pearl necklaces available in different lengths with different size beads.